The storage industry is getting exciting again. In order to increase capacity of NAND SSDs, there are two different routes being taken: either increase the number of bits per cell from 3bpc (TLC) to 4bpc (QLC) for a 33% increase, or increase the number of TLC layers per chip from 64 layers to 96 layers for a 50% increase. Each method has benefits and issues, however we have been waiting for the two technologies to actually be found on upcoming drives (rather than just on a press release). 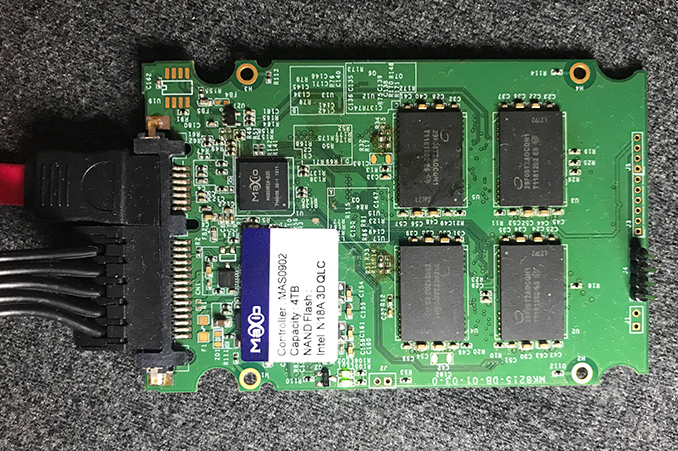 As part of the show we found a 4 TB SATA-based drive using a Maxio Technology controller and Intel's latest QLC NAND flash. We also scored some data on the speeds, as well as the state of play of the technologies. Intel and Micron are currently shipping 3D QLC NAND-based SSDs to enterprise customers who may intend to use them for WORM (write-once read many) applications or as HDD replacements. While it was obvious that this type of flash memory will eventually find its way to consumer applications at some point, it looks like this will happen earlier than expected. 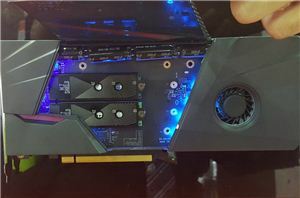 Maxio Technology, a developer of SSD controllers, demonstrated a prototype of its SSD featuring Intel’s 3D QLC NAND memory. 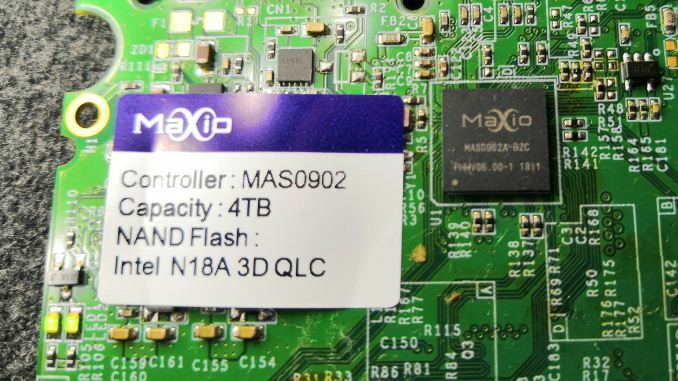 Maxio’s prototype drive is based on the MAS0902A-B2C DRAM-less controller as well as Intel’s N18A 3D QLC memory. The controller features two processing cores and supports a number of Maxio’s proprietary technologies, including AgileECC 2, WriteBooster 2 (SLC caching), Virtual Parity Recovery, and so on. This controller is apparently one of the smallest around, as Maxio stated that it is built on GlobalFoundries' 40 nm process. UPDATE 6/15: Maxio contacted us to correct its initial statement regarding the manufacturing technology used to make its controller. The company uses GlobalFoundries' planar 40 nm fabrication process to make the MAS0902A chip. It is noteworthy that while Intel/Micron mentioned that their QLC NAND memory can handle around 1000 program/erase cycles, Maxio states that with its controller this number may not be that high. Maxio was keen to point out that this is a prototype drive using early memory, and it expects that the final version of the NAND to be a lot higher. A side note about QLC: with more voltage levels per cell, it can be more difficult to read a cell due to voltage drift, and error correcting algorithms are in place to reduce signal bit errors caused by drift. When using cells that contain a higher number of bits, these algorithms have to work hardware to ensure data integrity, which can lead to higher power consumption or more transistors being needed in the controller. It can also have a knock on affect of reducing overall P/E cycles of the memory, which in part could be why this demo was not rated at the full 1000 cycles right now. 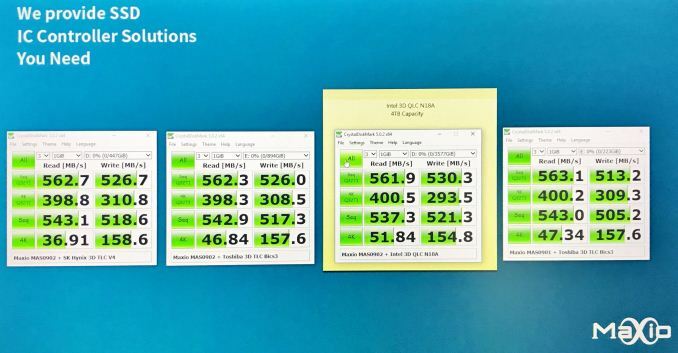 The current P/E rating, which may be good enough for high-capacity consumer SSDs where 0.3 DWPD is a typical rating for inexpensive SATA drives with 3D TLC NAND, may not be good enough for applications that require more writes (though, this is not a problem for WORM). Meanwhile, as Maxio and other developers of controllers are learning more about QLC, the endurance rating of memory with their controllers will increase. 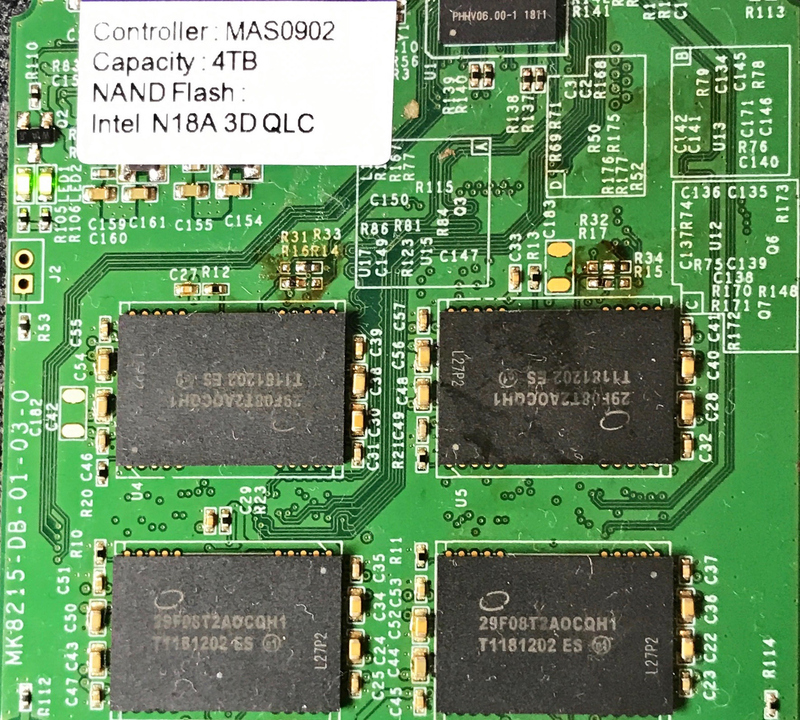 From performance point of view, the 4 TB 3D QLC SATA SSD is on par with drives based on various types of 3D TLC NAND, which is not particularly surprising as modern SATA SSDs reach SATA limitations. When it comes to actual numbers, the SSD provides up to 562 MB/s sequential read speed and up to 530 MB/s sequential write speed. Meanwhile, for those who need higher performance, there is the MAS0901 controller that supports DRAM. 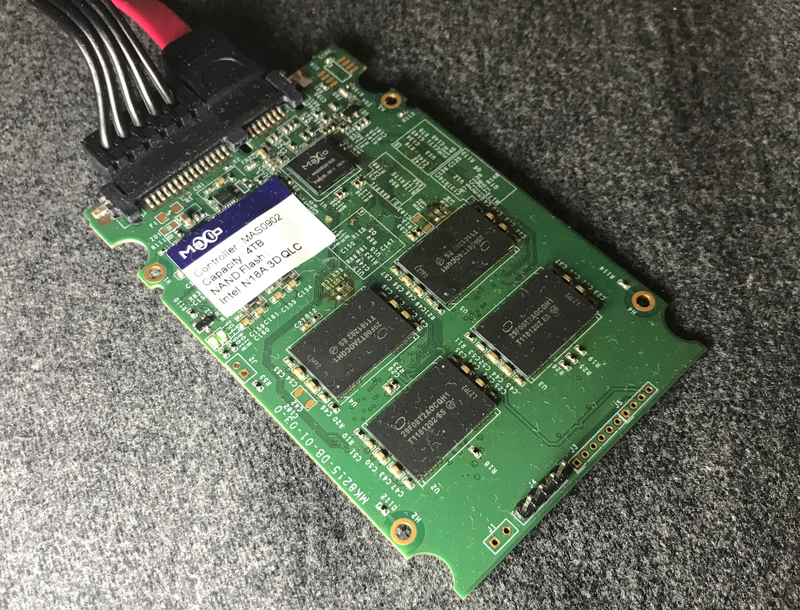 The 4 TB drive that Maxio is demonstrating is essentially a 2.5-inch PCB containing four multi-layer NAND memory packages that still feature an ES (engineering sample) status, so it is not like Maxio can ship this design straightaway. Anyhow, 4 TB of NAND in just four packages certainly look impressive. Maxio sells turnkey SSD solutions, but not complete drives. 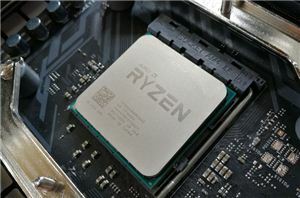 Therefore, the company cannot make statements regarding retail availability of SSDs based on Intel’s N18A 3D QLC NAND memory and the MAS902A controller. In fact, it is not even completely clear how an SSD supplier would position such a product: 4 TB SATA drive is an overkill for consumers, whereas lower capacities may not look really attractive keeping in mind the current endurance rating of the N18A memory with the MAS0902A-B2C. Meanwhile, 4 TB is not necessary enough for an HDD replacement in datacenters. For what it’s worth, the demonstration of a QLC-based SSD indicates that the new type of memory is here and is heading to all market segments. 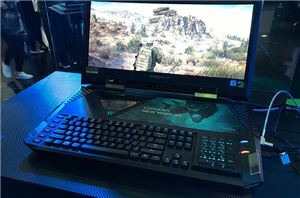 Update: Certain specifications about the Intel QLC that were initially published with this article have been removed at the request of Maxio Technology while the product is still in the prototype stages. When we get final numbers, we will publish a news story to confirm them. I doubt these QLC chips have existed long enough for them to meaningfully test cold storage longevity. QLC for cold storage - I don't think so. Doesn't TLC chips have guaranteed data retention in the range of 50 days? I highly doubt that this number will be higher with denser voltage thresholds.